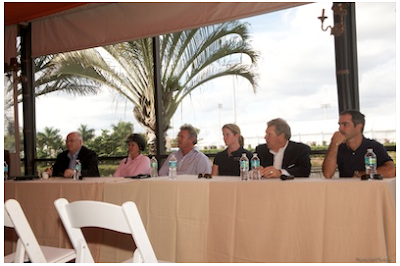 Wellington, FL - January 10, 2012 - The 2012 FTI Consulting Winter Equestrian Festival (WEF) hosted its opening press conference on Tuesday afternoon at the White Horse Tavern in Wellington, FL. A large crowd of local, national, and international media were in attendance to hear the latest news on the 12-week competition, which begins tomorrow. 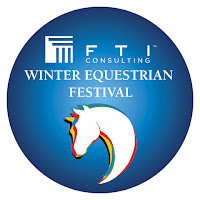 The FTI WEF will host thousands of the world's best horses and riders on January 11-April 1 at the beautiful Palm Beach International Equestrian Center (PBIEC) in what has become the world's largest and longest running horse show. This afternoon's press conference was hosted by Equestrian Sport Productions' (ESP) CEO Mark Bellissimo and President Michael Stone, with additional commentary from top hunter rider and trainer Louise Serio, Pan American Games Show Jumping Individual and U.S. Team Gold Medalist Christine McCrea, Wellington Equestrian Partner Hunter Harrison, and Olympic Show Jumping Gold Medalist Rodrigo Pessoa. Highlighted topics included the continuous growth of the show, the addition of many new sponsors, the upcoming USEF Olympic Selection Trials for the U.S. Show Jumping Team, and the broader expansion of the FTI Consulting Winter Equestrian Festival to reach horse lovers of all disciplines. Equestrian Sport Productions President Michael Stone began the press conference by welcoming everyone and expressing his excitement for the season to come. Stone emphasized the progress of the show grounds, the increased prize money, and the increased caliber of classes that will be held during this year's competition. "Over the years we have been talking a lot about construction and development, and for the first time the show grounds are ready to go," Stone stated. "Prize money is up significantly. The last six events will have five ROLEX FEI world ranking classes, which make it by far the biggest international horse show in the United States. For the first time the Olympic Trials will be in line with the USEF National Championships. We have moved on to such an extent now, that people are realizing that this is the place to come. Many foreign riders are coming to use this as Olympic preparation and we are expecting huge numbers from California, Central and South America and from Europe." ESP CEO Mark Bellissimo spoke next, commenting on the transformation of the horse show. "We are very excited about this year," Bellissimo smiled. "This is going to be by far our biggest year. If you look across every element of our revenue base, from stabling to entries to sponsorship to hospitality, we are up at least 10 to 15% in every one of those categories in a very difficult time. I think that is a testament to a tremendous investment by our partnership. We have a group of people who are not only committed to this festival, which has increased in both size and stature, but are very committed to this community and really trying to make it the centerpiece of the world for winter equestrian competition." Bellissimo explained that his goal is to develop an "equestrian lifestyle destination", unifying the many equestrian disciplines and bringing horse lovers of all kinds together. "The unifying theme here is the horse, not hunter, jumper, polo, or anything else. For people who love the horse, we want to make it accessible everyone - to the Olympic caliber riders, to someone who just got his first western horse, and to people who just want to be a part of the lifestyle. I think that we are going to see a tremendous amount of growth in that area and I think that we are going to see a much broader group in Wellington in the future." "We are hopeful that this will be our greatest year in terms of spectatorship," Bellissimo continued. "We believe that the next transition for the sport is to get it even more spectator friendly and family friendly." 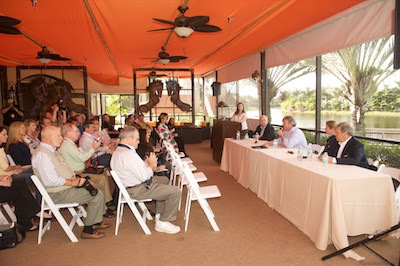 Also speaking during the press conference, Hunter Harrison represented Wellington Equestrian Partners. Harrison spoke about the growth of the show and the importance of sponsors. "It is very pleasing for me, having been here for about 15 years now, to see the progress that this venue has made in all aspects in a relatively short period of time," Harrison said. "We owe a great deal of thanks to Mark Bellissimo for the leadership that he has shown and some of the battles that he has fought to see that this show is a success and meets the standards that we have set for ourselves, which are pretty high. 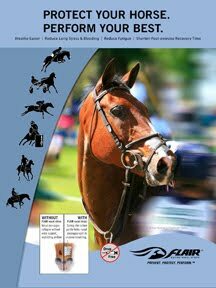 As a former large sponsor of the show, I know that you cannot run a horse show of this magnitude without sponsors. There is an exciting list of new sponsors this year and some that have been with us for years and years that we could not do without." Questions for Christine McCrea followed with a conversation about what it means for the U.S Show Jumping Team to have their Olympic Selection Trials at the FTI WEF this year. The winner of the selection trials will be named the national champion, as winner of the U.S. National Show Jumping Championship. McCrea stated, "It is really exciting as an American jumper rider. We are so fortunate to come down here and show and to have everything wrapped into one, especially in one week, is going to be really cool. I thank Mark for putting that all together and working with our federation to make that happen. Everybody is excited; it is at the front of everybody's mind." Louise Serio, the winner of last year's $50,000 USHJA International Hunter Derby, spoke about the exciting opportunities for hunters at this year's WEF. Serio noted, "The hunters are looking forward to going back on Saturday night during week six. That is our big week when we get to go in the International Arena and have a Saturday night class. We hope everybody will come and watch. It is really quite exciting for all of the riders. The professionals, juniors and amateurs all show against each other. Then the derby is the last week down here, the $50,000 class, which is our biggest money derby all year (outside of the Finals). Everybody is excited; there are a lot of people with a lot of horses, so we are looking forward to a good year." Finally, Rodrigo Pessoa spoke from the point of view of the international show jumper, noting the advantages of competing in Wellington during the winter. "I think that, competition wise, this is as hard as anywhere in the world because America is obviously a very strong country with a lot of good horses and riders," Pessoa said. "It is tough to win here; the competition is very hard. It is a privilege to be here for so many weeks at a great facility like this one. With the weather like this, it makes you enjoy your time very much. Of course the management has been working really hard to make this facility look world-class and it is really getting there. The changes the last couple of years have been incredible and the prize money is great thanks to all of the sponsors." Equestrian Sport Productions looks forward to a fantastic season as the 2012 FTI Consulting Winter Equestrian Festival kicks off on Wednesday, January 11. 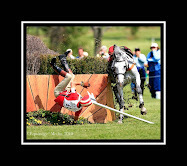 For more information and for a full schedule of events, please visit www.equestriansport.com. Photo credit: The panel of Michael Stone, Mark Bellissimo, Louise Serio, Christine McCrea, Rodrigo Pessoa and Hunter Harrison spoke about the 2012 FTI Consulting Winter Equestrian Festival at the opening press conference. Photo © ManciniPhotos. These photos may only be used in relation to this press release.